Mathew Kade has taken cases to find missing people many times. He's taken cases to find items lost during the Fall of civilization after the Corporate Wars. He's investigated murders and thefts. But the search for a serial killer in the tunnels under a broken city might be the strangest case he's taken. With the help of a couple of Squires from the Society of the Sword, he is in pursuit of a deadly person who has been killing for more than twenty five years. Looks like Kade has his work cut out for him. 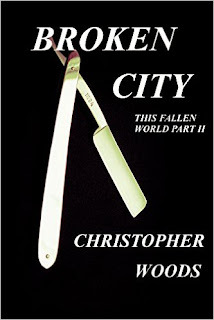 You can find my review of the first book - This Fallen World - here. In terms of the first book I thought it was fantastic and I hoped (prayed in fact) that Woods would do a sequel and lo-and-behold he has. I normally don't read short books (less than 100 pages). In fact I really don't like short stories. But the first book was so, so, good I didn't care if it was only 10 pages long, I had to get more of the world Christopher Woods created and of the main character Mathew Kade - who is the definition of badass! In the sequel, we learn more of the main character Kade, and also the post-apocalyptic world he inhabits. The storyline follows Kade as he investigates a series of gruesome murders where the victims have been torn apart. There are some fascinating and twisted concepts Woods created in his post-apocalyptic world and I loved it. The writing is succinct and to the point, which may deter some away, like those who prefer more embellishment in their prose, but for me I found it perfect. Most times I like to read scenes where I'm not swimming in flowery description and dialogue which go on forever. Don't get me wrong some novels need that level of description just to make sense of the story but this book is definitely not that type. If you like the idea of a main character who is basically Rambo, Chuck Norris, and Mad Marx rolled into one then this series is for you. Hello, again, still reading your reviews. As you say in this review, I also don't often read books under 100 pages, and I do usually like my prose quite 'embellished'. But this sounds like a good story. I think I might wait for a third book to come out, so if I like them I can enjoy them all in one go and have a nice long read. I notice you said you don't like short stories, but how would you feel about an anthology of linked short stories? I have one coming out soon, that I was thinking of submitting to you for possible review. They share common settings, characters and subplots, but they are all distinct stories. So if short stories are really not your thing, shall I wait til I have a novel for you? Hi Jonathan, thanks for continuing to read my reviews. I know what you mean by letting them build up, I often do that with tv series as well. But the first book was so good that I couldn't wait any longer. Email me the details of your book, and I will have a look. But I hold no promises.